Development and implementation of new interrogation architectures (WP 1), that will make Distributed Optical Fibre Sensors (DOFS) more efficient and performant (millimetre scale resolutions over more than 100m, dynamic measurement up to 1 kHz refresh rate, etc.). Fabrication of novel optical fibres (WP 2), sensitive to other parameters than temperature and strain, including pressure, electric field, curvature, gas concentration, etc. that will be used in DOFS systems. The new interrogation architectures and fibres complementarily developed will be “assembled” together to create novel DOFS systems, which will all be implemented and validated with on-field deployment (WP 3). This task will be conducted by FINESSE partners, all working in different fields with high industrial potential for the deployment of DOFS, ranging from civil and geotechnical engineering to radioactive waste management amongst others. 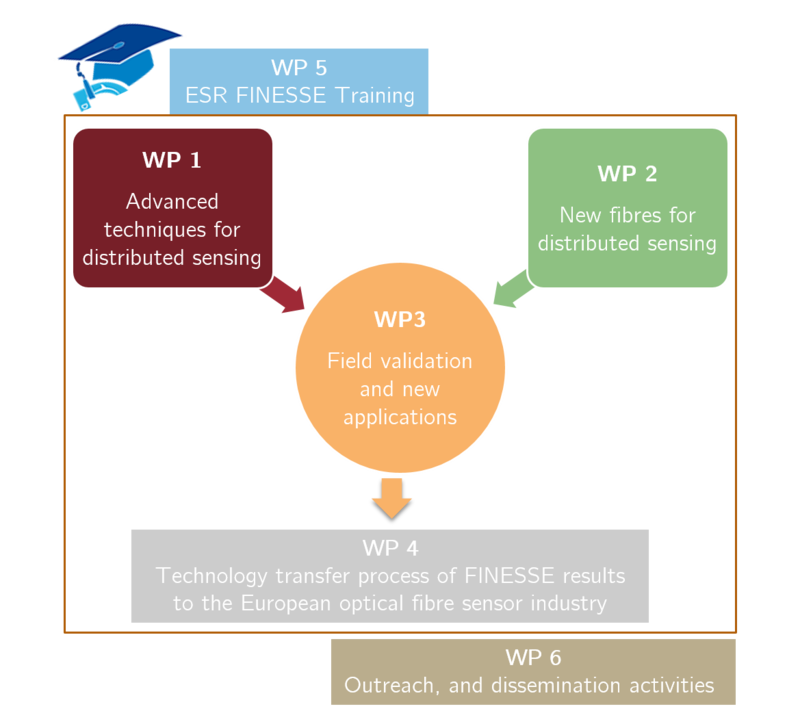 The FINESSE consortium recognizes a catalyst is needed throughout the project runtime to ensure an efficient and effective technology transfer process of academic research results to the European optical fibre sensor industry (WP 4). Interdisciplinary research in the emerging domain of technology transfer research will allow for the development of methodologies to identify, screen and assess opportunities in optical fibre sensing technologies. Research results on business concept refinement and the academic entrepreneur’s interactions with industry will be fed back into FINESSE’s core team for superior technology transfer results. This approach will ensure swift transfer of the ESR fellows from academics to industry after their training. To kick-start the future career of the 15 fellows, destined to bring a meaningful contribution to the field of DOFS both in European academy and in industry, the FINESSE consortium has created a unique training programme (WP 5) to provide not only academic training at the highest level, but also substantial field experience in private companies and training in transferable skills. To communicate to the society the benefits of the technology developed in the network and to attract high school graduates to pursue a scientific or engineering career in photonics, all FINESSE members will engage in numerous dissemination and outreach activities (WP 6).